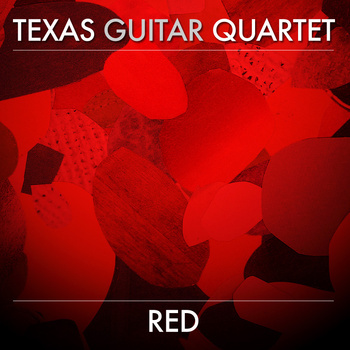 A few months ago the Texas Guitar Quartet — Isaac Bustos, Jonathan Dotson, Alejandro Montiel, and Joseph Williams — launched a Kickstarter campaign to finance their debut recording. I received the album for which I pledged in mid-March, and after a bout of repeated listens I knew I had to review it. The reasons are quite simple: this is truly an excellent work, sensitively performed and beautifully recorded, as well as featuring several new or novel selections. As a matter of fact, each track on the disk is a premiere of sorts—be it the new original composition Red by Joseph Williams, the debut recording of Antoine de Lhoyer’s Air Varié et Dialogue, or the trio of new arrangements that round off the album. These latter selections are ambitious—they include one of Bach’s Brandenburg Concertos (number three, to be precise), and Beethoven’s Egmont Overture, as well as a pair of more likely arrangement candidates in Isaac Albeniz’s Castilla and Aragón. I must confess raising an eyebrow (or two) when first going over the tracklist, but any trepidation on my part was premature: the TxGQ guys know what they are doing, and they manage to pull off every piece on this recording in a musical and convincing manner. The opening Bach is played with élan and gusto; the arrangement distributes the parts among the four guitars in an effort to mitigate the congestion in the midrange inherent in the instrumentation — I still think these kind of arranging projects would benefit from the employment of extended range instruments, like bass and terz/alto guitars. In a similar way, the Beethoven pushes the ensemble to the very limits of the medium: I couldn’t help but long for a bit more oomph at the climaxes. Despite these minor aesthetic quibbles, the group pulls off these works with style, and I imagine hearing a live performance would make for a truly memorable experience. The arrangements of two Albeniz pieces — extracted from the composer’s celebrated and well-known Suite Española — play to one of the ensemble’s strengths by employing an extensive array of coloristic devices, not in imitation of other instruments but for sheer expressive effect. At times I was convinced that the pieces fit on the four guitars better than on the original piano—a remarkable achievement for any arrangement. The two pieces that were originally conceived for guitar quartet — as I mentioned, both world premieres — are similarly remarkable. The Lhoyer piece, which is among the earliest examples of the genre, underwent some re-arranging to bring all four parts to the same general difficulty level, vis-à-vis the more hierarchical distribution of the original. The piece is a set of variations alternating between dark, Sturm-und-Drangy moods and a more lighthearted tune, and I wouldn’t be surprised if this became more popular among ensembles in the next few years. Finally, Joseph William’s original suite Red explores some serious existential ground and provides a refreshing and modern close to the entire record. Ranging from rhythmically driven to more calm and lyrical sections, William’s writing is idiomatic yet never gimmicky, as it empolys the natural resonance of the four guitars to great harmonic and coloristic effect. As an album, Red is flawless both in terms of the execution of the four players (all accomplished soloists in their own right, yet truly gifted and attuned as an ensemble), as well as in the quality of the production, with its lush, clear, and rich sound. After a debut of this caliber, I am eager to see where they will be going next; I can only recommend that you check out their work, which is available on Amazon, Bandcamp, CDBaby and iTunes.